Sri Lankan shares closed higher on Wednesday after two straight sessions of losses as foreign investors actively bought into blue chips, with the net stock buys touching nearly 15 billion rupees so far in the year. Foreign investors bought shares for a 24th straight session, buying a net 318.6 million rupees ($2.10 million) worth of stocks on Wednesday. They have snapped up a net 12.4 billion rupees worth equities during the period and a net 14.9 billion rupees worth year-to-date. The Colombo stock index ended 0.36 percent firmer at 6,516.26. The index has climbed 9.1 percent in the 19 sessions through Wednesday, having risen for 16 sessions in that period. It added 2.1 percent last week, marking its fourth week of gains. “Foreigners are very active and buying aggressively, while local investors are cautiously waiting to buy,” said Dimantha Mathew, head of research, First Capital Equities (Pvt) Ltd. Turnover stood at 1.44 billion rupees, higher than this year’s daily average of 882 million rupees. Market heavyweight John Keells Holdings gained 1.1 percent, while Ceylon Tobacco Company rose 0.6 percent. John Keells Holdings, which accounted for 81 percent of the day’s turnover, jumped 2.2 percent, while top lender Commercial bank of Ceylon rose 1.7 percent. 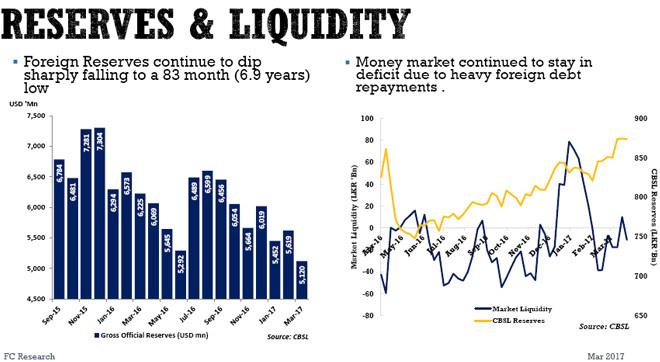 Apr 19, 2017 (LBO) – Sri Lanka’s external reserves have fallen to a 6.9 year low after country’s reserves dropped almost 9 percent to 5.12 billion US dollars in March 2017, a research note showed. Central Bank has purchased 192.23 million dollars of foreign exchange from commercial banks at market rates in March while selling just 13 million dollars in the month. Foreign currency reserves dipped 11 percent to 4.16 billion US dollars and reserves in Gold were 0.89 billion US dollars. Central Bank’s Treasury bill holdings were up from 211.32 billion rupees in February to 233.32 billion rupees in March. First Capital said in a research note that the sudden increase in the market liquidity towards the latter part of the month and renewed foreign and local buying interest resulted in yields dipping by 10-25bps specifically in the 2 year to 15 year bonds. During the year up to 12 April 2017, Sri Lanka rupee has depreciated against the US dollar by 1.2 percent. First Capital Holdings further highlighted that the money market continued to stay in deficit due to heavy foreign debt repayments. Sri Lankan shares rose on Tuesday as foreign investors bought blue chips, with the market seeing overseas fund inflows for 18 consecutive sessions. Foreign investors net bought shares worth 172.8 million rupees on Tuesday. They have bought equities worth a net 5.4 billion rupees ($35.57 million) in 18 straight sessions, taking the year-to-date net foreign inflow into equities to 7.9 billion rupees. The Colombo stock index ended 0.5 percent firmer at 6,382.37 after falling on Monday for the first time in 12 sessions on profit taking. The index had climbed 7.2 percent over 11 sessions up to Wednesday. The market was closed for Sri Lanka’s traditional new year holidays on Thursday and Friday. “Foreign buying is very strong at the moment which is a very good sign. Foreigners are bullish,” said Dimantha Mathew, head of research, First Capital Equities (Pvt) Ltd.
Sri Lankan authorities are in the process of raising up to $1.5 billion through sovereign bonds in the near future. Turnover stood at 836.1 million rupees, more than this year’s daily average of 775.6 million rupees. Shares in top mobile phone operator Dialog Axiata gained 2.7 percent, while conglomerate John Keells Holdings Plc rose 1.1 percent. For finance companies in tough conditions, the adage “bigger the better” is key to success, according to First Capital Equities Research. In its latest research on the sector, FC said it expects finance sector to face moderately tough conditions to operate with thinning margins and new LTV regulations leading to slower and previous but moderate credit growth. “Despite slow economic conditions rise in NPLs are likely to be slow amidst price appreciation in vehicle prices as bulk of the lending is attached to vehicles. We believe the larger finance companies have an advantage with lower cost of funding and large conversion levels from leases to loans which improves re-pricing abilities at times of rising interest rates,” said FC Research, which is recommending “Hold” for the sector stocks. The broking firm also said with rising interest rates and bulk of the lending attached to leases finance sector is likely to experience a dip in margins while credit growth is expected to remain moderate around 16-18% despite deceleration from 2016. New LTV regulations also likely support the slower credit in 2017E. Despite rise interest rates and slower economic conditions FC Research expects NPL provisions of finance companies to continue to stay on the back significant price appreciations in the second hand vehicle market. Higher vehicle prices are likely to deter related borrowers from default while even if defaulted higher vehicles prices ensures finance companies of eliminating losses and recovering bad debts. “Finance companies with better rating and larger asset base tend to have a lower cost of funding while some finance companies have already converted significant portions from loans to leases enabling them to re-price part of the assets in line with interest rates. These two conditions being satisfied enables selected finance companies specifically identified as PLC, CFIN, LFIN, COCR and LOFC to perform better in tough environment,” FC Research said. “We expect the selected companies to provide an average total return on equal weightage of c.51% during a 12-month period,” it added. The interest margins of finance companies in the country are expected to shrink during this year amid rising interest rates, as bulk of the loan portfolios comprises of fixed rate leasing, mostly given on vehicles, according to a finance sector report by a leading investment banking group. The average credit growth in the finance company sector is forecast to remain around 17-18 percent, a moderation from the high of 30 percent in 2016. Sri Lanka’s licensed finance companies and specialized leasing companies together own about Rs.853 billion in assets, roughly 7.0 percent of the total assets of the financial system. They had a party time during the last two years with record high profits and growth. According to data compiled by F C Research, the research arm of the First Capital Group, they reported total earnings of Rs.21.2 billion for 2016, up from Rs.16.9 billion in 2015. Sri Lanka’s banks and finance companies were the direct beneficiaries of the slashing of taxes on vehicle imports and the lower interest rates in early 2015 by the good governance regime to keep their election promise to enable every family to own a car. But that party did not last long as the economy was plunged into a balance of payment crisis with the Central Bank selling reserves to defend the rupee. The Monetary authority was also compelled to keep the interest rates artificially low by printing scores of money to make way for the fiscal profligacy. Credit to the private sector soared recording historically highs year-after-year, of which most of the moneys went to satisfy the unfettered consumerism on the part of the Lankans, including close to 1.5 million units of vehicle imports during 2015 and 2016, causing chaos on the streets. Then the excise duties were raised and higher down-payments were mandated by the authorities to curb the influx of vehicles into the country. This has a significant impact on the margins of finance companies, profitability and growth because at least 50 to 60 percent of their portfolios comprise of leasing and hire purchase. The margins come under pressure because leasing, mostly 5 – year contracts, cannot be re-priced but the deposits, of which over 90 percent tend to be 1-year deposits, get re-priced frequently. However, the larger finance companies with better credit ratings and access to cheaper funds could be less affected as their overall cost of funds could be maintained at a minimum. There could also be a possibility of finance companies shifting from vehicle leases to vehicle loans to ward off any future impact on margins. But this may come with the risk of not being able to re-possess the vehicle when the borrower defaults. But the default risk becomes lower when the vehicle prices rise because the borrower now has an asset worth more than the original value for which he had entered into the lease or the loan agreement. F C Research forecasts the private sector credit growth to moderate to 12-14 percent during 2017 from 21 percent in 2016. But the finance sector is expected to show a faster credit growth of 16-18 percent because they have traditionally been growing at a faster rate than the banks. Nevertheless the research house does not expect the rise in interest rates to have an adverse impact on the finance companies’ asset quality because the re-sale value of the vehicle stock tends to increase resulting in lower provisions for possible bad loans. “New LTV regulations, rupee depreciation and increased taxes have led to a significant rise in vehicle prices in the brand new vehicles market invariably resulting in rise in second hand market vehicle prices. We believe the appreciation in asset value discourages borrowers from defaulting while also it helps finance companies to easily dispose the asset in case of a default without financial loss as the value of the asset is higher,” F C Research said in their sector report. Considering these mixed outlook, where negatives will be offset by positives, FC Research advises the investors to ‘hold’ the finance sector stocks but singled out a few stocks with a ‘strong buy’ advise. Sri Lankan shares rose for the tenth straight session on Tuesday to close at their highest in nearly four months, helped by positive sentiment over continued foreign buying in blue chip stocks. The market has seen fund inflows for 15 straight sessions through Tuesday, with foreign investors buying net 4.9 billion worth of equities in the same period. They net bought shares worth 49 million rupees ($323,163) on Tuesday, raising the year-to-date net foreign inflow into equities to 7.39 billion rupees. The Colombo stock index ended 0.2 percent firmer at 6,305.54, its highest close since Dec. 9. The index rose 3.8 percent last week, posting its second weekly gain in seven. The index has climbed 5.53 percent in the last ten sessions through Tuesday. “It was a dull day as most of the investors are on holiday ahead of the new year,” said Atchuthan Srirangan, a senior research analyst with First Capital Holdings PLC. However, turnover stood at 281.6 million rupees, its lowest since March 21 and well below this year’s daily average of 757.3 million rupees. Shares of conglomerate John Keells Holdings Plc rose 1 percent, while Lanka ORIX leasing Company Plc rose 1.16 percent. After many months of pessimism, the Colombo stock market has shown signs of positivism spurred by heavy foreign buying boosting overall sentiment. As of Friday, both price indices were up year-to-date – the All Share Index by 1.04% and the more active S&P SL Index by 2.5% after being negative during most of the first quarter. More importantly, foreign buying has accelerated, thereby swinging interest back into the market and boosting sentiment as confirmed by a near 4% gain in ASI last week and over 5% during the past nine market days. Foreign buying spree which kicked off in late February brought in a net inflow of Rs. 5 billion in March. As of Friday net foreign buying was Rs. 7.35 billion year-to-date. The market has seen net foreign buying for the past ten consecutive weeks and during the past 14 market days the value was Rs. 4.85 billion. The inflows are significant given the fact that for the entirety of 2016 the inflow amounted to only Rs. 400 million whilst in 2015 there was a Rs. 5.4 billion outflow. Most analysts welcomed the newfound resurgence in the market as “long overdue” given the attractive valuations. However, it is foreigners who are capitalising on the bargains, especially fundamentally sound blue chips and second tier stocks. Brokers expect locals who have cashed in from foreign interest to return to the buying side, a move, which if it takes place after the Sinhala Tamil New Year holidays, will help sustain the rally. The Price Earnings Ratio of the market is around 12 times with some fundamentally strong stocks much lower reinforcing the attractiveness of equities. Last month Asia Securities told the Sri Lanka Investment Summit in Hong Kong that when the three largest stocks, which account for 18% of market cap, are excluded the PER is more attractive at nine times. It also said that valuations at the CSE are close to post-war bottoms while when net foreign buying is positive, the market moves up with a 12-month lag. Capital markets in general are however hoping for a more convincing return of local investors, who have been shunning the Bourse for seemingly better returns outside. This is despite several leading broking firms’ chosen or recommended portfolio of stocks having provided much better returns than some fixed income options last year. “Foreigners see value in some select blue chips now. Now we see there is a demand for stocks mainly because foreign investors are buying them gradually,” Acuity Stockbrokers CEO Prashan Fernando was quoted as saying by Reuters last week. “Foreign buying and foreign interest in blue chips are pushing the market up and we hope the trend will continue,” said First Capital Equities Ltd. senior research analyst Atchuthan Srirangan. “Though retail investors are still on the sidelines, the good thing is foreigners and high net worth investors are grabbing the opportunity and buying,” Yohan Samarakkody, head of research at SC Securities, was quoted as saying by Reuters earlier in the week. “The underlying fundamentals have not changed as yet. The economic outlook is gloomy with high interest rates. But all that negativity has factored in. With the market reaching an oversold level, it became attractive to investors who have the holding capacity and they are capitalising on that situation,” Samarakkody added.